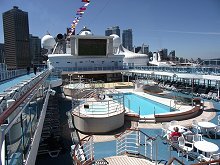 This photo album and review is from a cruise that I took on the Coral Princess, sailing northbound from Vancouver, British Columbia, to Whittier, Alaska. We left Vancouver on June 12th, 2010, and docked at Whittier on the 19th after visiting Ketchikan, Juneau, Skagway, Glacier Bay and College Fjord. I only took one major excursion during the cruise, a rail/bus trip into the Yukon from Skagway. After editing, I have 733 photos in my trip file, shot with a Fujifilm S1800 - 144 of them have been posted in this journal. 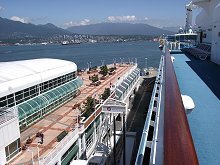 While I almost always recommend that people arrive in their departure port at least a day before sailing, Vancouver is only 2 hours away for me, and I spent most of my life living there so touring isn't a high priority. 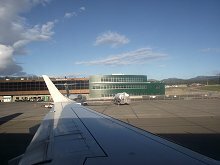 The seat I got in the little Canadair CRJ 200 was over the wing so not prime, though it was a window so I shouldn't complain. 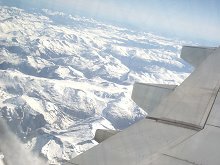 The forecast was for sun at each end of the 2.6-hour flight, and that's what we got. The cloudy period was spent listening to good music and reading an excellent book on Alaska whales that I bought yesterday. 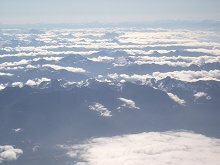 Patterns of morning valley cloud as we neared Vancouver. I never tire of watching the earth pass by below me - the geology, the weather, Man's impact on it are all fascinating. 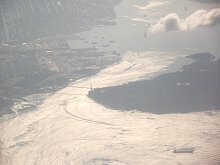 The Lions Gate Bridge and Stanley Park. 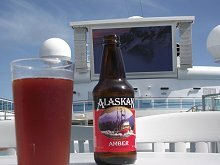 In a few hours I'd be on the deck of the Coral Princess, sailing past the park and under the bridge to start another Alaska adventure. 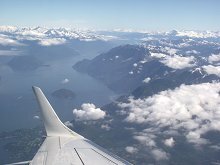 The view up Howe Sound towards Squamish and Whistler as we banked to head out to Surrey for final approach. Arriving in Vancouver, there were 2 Princess reps waiting at the baggage pickup area. They offered to send me to Canada Place by taxi but I said I'd wait for the regular shuttle bus an hour later - it was a good opportunity to get a coffee and muffin to get me through what could be a lengthy boarding procedure. The driver of the shuttle bus gave a very good tour en route - I hope that his tips reflected the effort that he put into it, but from the number of "thank you"s I heard from him as we got off the bus, I don't think it did. 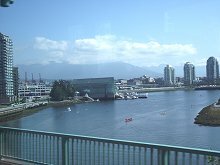 This photo shows False Creek, the southern edge of downtown Vancouver, at 11:10. The boarding process at Canada Place was quick and easy, taking perhaps half an hour. 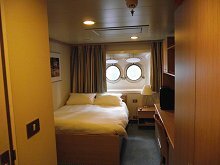 The end result is that there's a photo of you in the ship's computer, and you have a "Cruise card" which is what you use for everything on board the ship, from getting into your cabin to buying drinks, and for getting off and back on the ship at port stops. 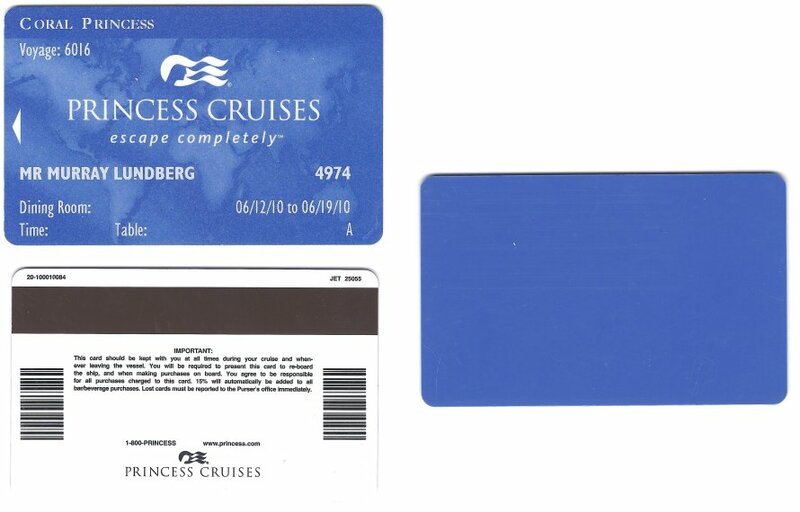 As a crew member I actually had 2 cards, a regular one and a plain blue one for cabin access - you can see those cards here. On the Coral Princess there's a cabin specifically for the naturalist in the crew area on Deck 5 aft, #5714. While not up to passenger cabin standards, it's an officer-category cabin and not bad at all. 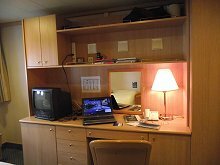 It has windows and wireless access, two things that are very important to me, particularly on a 3-week voyage. 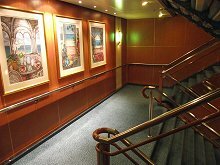 My first impression of the ship was very positive - the decor is very attractive and the art collection particularly good. 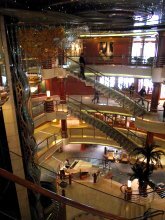 This is the 4-storey atrium in the lower center of the ship. The pianist whose sounds greeted me as I boarded definitely aided in that positive first impression. 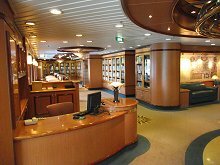 The comfortable and well stocked library. I generally spend a fair bit of time in the library, so having one with a good feeling to it is important to me. The lovely Lotus Pool area. The view from our docked position at Canada Place. The Lido Deck, with the huge MUTS screen (Movies Under The Stars) dominating. It was showing the World Cup games when we boarded, and I was very surprised by the image quality - impressive technology. The Sanctuary is an interesting concept. 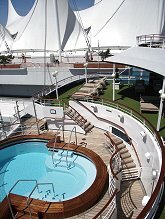 Princess has taken the prime aft location on Decks 12 and 14 (there is no Deck 13) and turned it into a small no-kids private club. It costs $10 per half-day, $20 per day or $90 for the entire cruise. A look at the type of art that graces every stairway. 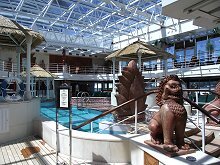 The sailaway party on the Lido Deck was by far the best-attended I've seen. Great music and the place was packed. A look at North Vancouver as we sailed away from Canada Place, starting this new adventure. 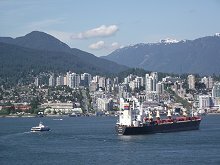 To the left of the freighter is a SeaBus, an important link in the city's excellent public transportation system. 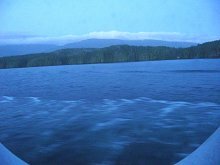 Sunday, June 13: Johnstone Strait from my cabin at 04:46 on Day 2. Sunrise today was at 5:16am. Johnstone Strait, between Vancouver Island and mainland British Columbia, is a particularly good area to see orca, but I didn't see any today. 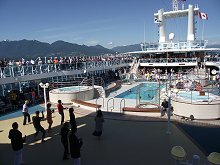 This is a very scenic area that's only seen by the people who sail from Vancouver - Seattle departures sail in the open ocean to the west of Vancouver Island. Sea days are always loaded with activities, and the Princess Patter (the daily newsletter) that had been put on my bed last night was full of possibilities. 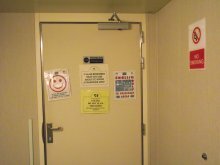 The door from the crew area to the public areas has a few reminders - to smile, to speak only English, etc. 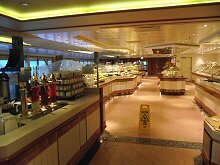 Horizon Court, the buffet on Deck 14 forward. I was up early this morning as always, and the Horizon Court was the source of coffee to get it started and to greet the sun. How's this for a fine location for breakfast? 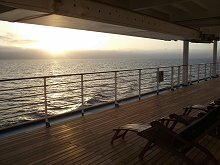 The sun popped up over the low cloud layer at 5:41 as I was on the Promenade Deck (Deck 7) heading back to my cabin to get ready for my presentations today. 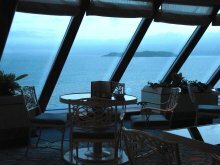 The community of Port Hardy, near the north end of Vancouver Island, could be seen through the porthole of my cabin. It was sunny and 49�F, very different than what the weather forecast yesterday morning led me to expect. This was a busy day for me, with 2 presentations in the main theatre - "Glaciers of Alaska" at 12:30 and the "The Gold Rush Trail" at 2:30. I didn't have anything to eat until after my second presentation, which ended at 3:30. By then I was starved, and pizza and beer on the Lido Deck tasted great! It also ruined my appetite for a real dinner, though, so I skipped the first formal night. 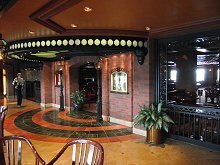 This is the entrance to the Bayou Caf� & Steakhouse, one of the ship's specialty restaurants that have a surcharge. They're both getting very little use so far from what I've seen - while Cathy and I always go to at least one during a cruise because of the extra-special food and service, I don't go when I'm sailing by myself.